An "ideal" probe is just that: an ideal. The ideal probe would have a perfectly flat magnitude response over its entire infinite frequency range. It would offer a perfectly linear phase response, and would present zero loading to the circuit under test, implying infinite impedance. Unfortunately, neither we at Teledyne LeCroy, nor anyone else for that matter, has been able to create an ideal probe, as the realities of physics render it impossible. So we're stuck with the probes we are able to make. The good news is that these probes are pretty good. We can get fairly close to making a real-world probe behave in an ideal fashion. 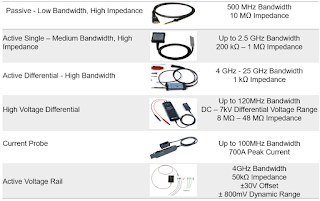 But achieving a perfectly flat magnitude response and a perfectly linear phase response from DC to tens of gigahertz is a rather difficult exercise in hardware design. The same applies to loading, as impedance is finite. Thus, real-world probes diverge somewhat from the ideal, but there are ways to compensate for these non-ideal behaviors to greater or lesser extents. 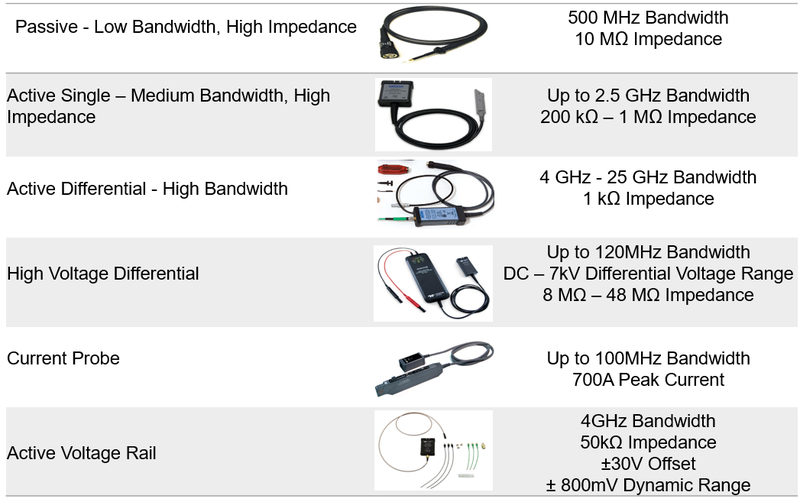 Oscilloscope makers all bring to market a wide variety of probes for users to choose from, depending on the application (Figure 1). Along with the probes comes a plethora of accessories as well as the oscilloscopes themselves. Next time, we'll begin an in-depth discussion of probe bandwidth.